Or if a Yelper has a bad meal and there’s no mobile device to hear it, does Foursquare make the recommendation? Everything is quiet at Foursquare HQ in New York. Perhaps too quiet. In the lobby, there is a table shaped like a giant check-in logo — now unused for checking of any sort. It’s nearly August when we visit. Maybe everyone is in the Hamptons. For a company that had just rolled out what was touted as a dramatic new plan, there seems to be a dearth of activity at the mothership. But Foursquare has always been the duck of the digital start-up world — kicking furiously beneath the water while co-founder Dennis Crowley maintains an air of millennial nü-slacker tranquility. So maybe everyone isn’t in the Hamptons. Foursquare’s Phase Two began in late June with the rollout of a vastly revamped app and a new focus. No longer were check-ins and badges the point, but rather socially driven, location-based recommendations angled as “Explore.” By introducing Local Updates and the paid Promoted Updates for local business, Foursquare was trying to change the way consumers, businesses, and brands think about service. The app built its audience through game-like engagement features, encouraging friends, acquaintances, and strangers to compete on smartphones. Having exhausted that launch (though not without building a mass of data), it turned to the next phase. If Foursquare were a rocket hurtling into space powered by a fuel mixture of user growth rate and data collection, it now detached its boosters — mayorships and Swarm badges fell away as the capsule left the atmosphere. Its orbit? Referrals. The pivot is a vital one, potentially saving Foursquare from the fates of its predecessor Dodgeball and its peer Gowalla and vaunting it into competition with the likes of Yelp and Google’s Zagat (which is an element of the recently announced Google+ Local and may soon be joined in that program by Frommer’s) and, possibly, a Facebook Places product (should Facebook ever get serious about it) as well as the Citysearches, TripAdvisors and Open Tables of the world. And with its mobile-first approach and facility with data sets, Foursquare could be better positioned than any of its peers. Foursquare, of course, has been collecting a not dissimilar data set — one that is arguably more rich than Yelp’s (despite the relative age of the two services). This is largely due to that fact that the vast majority of Foursquare’s data comes through mobile devices. Furthermore, Yelp has a very different type of company culture than does Foursquare. As Rosenblatt said, “We’re getting really smart about recommending things to you.” Nobody at Yelp says this. In August, Yelp unveiled a new home-page design that, according to an official statement, “places a greater emphasis on activity from you and your friends.” Yet its new interface was nearly indistinguishable from the old hurdy-gurdy home page. Location doesn’t seem to be the new Yelp’s strong suit either. When I logged in on my laptop from my home in Northern California, it gave me recommendations for Los Angeles. When I searched for reviews of a restaurant on Main Street in my town — while I was standing in front of the restaurant — it couldn’t find the listing. The amount of traffic Yelp receives from mobile is a small percentage of its overall traffic. Yet a large percentage of its searches come through mobile. According to the company, of 50 million monthly active users of Yelp, 4.5 million come from mobile devices, but 35 percent of searches come via mobile. The level of relevancy or recommendations becomes crucial when applied to local ads. If Foursquare is successful in its revamp, its ad products could have a much more attractive ROI and lead generation for local advertisers than products from Yelp or other competitors. That said, it’s early in the game, and difficult to see the spend as anything beyond experimental at this stage. “Something like highly relevant recommendations from nearby businesses that have a social layer around them is a good example of something that really could be ‘native’ content but in the form of branded messages,” says Williams. Forrester’s Parrish calls Local Updates and Promoted Updates an interesting low-cost prospect for local businesses. She says that mobile in general, “is probably the thing that will most clearly demonstrate ROI for small businesses.” But, she says, effective mobile advertising will have to evolve. “Whether it’s Yelp, or Foursquare or Facebook or whomever: Right now mobile advertising is about better-targeted paradigms that are taken from the online advertising space and I think that that is fundamentally wrong…mobile advertising is going to be about reaching exactly the right people with exactly the right message at exactly the right time in a mobile-specific way. Now, I don’t know what that mobile-specific way is eventually going to be. Will Foursquare be able to come up with what this new mobile advertising paradigm technically is? They’ve got some pretty-freaking-smart people over there. I wouldn’t be surprised at all if they were the first ones to figure it out.” But before Foursquare can ride off into the sunset of a brighter tomorrow, it is going to have to deal with today. 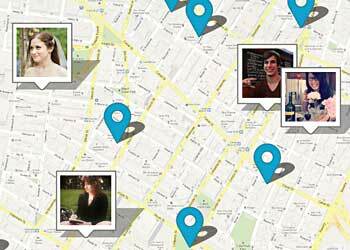 In August, Foursquare backtracked on its changes when users revolted at the loss of the nearby friends feature. Dedicated users, it seemed, weren’t quite ready to give up the social networking stalking function. About a month after pushing the Explore feature to the fore in the app, Foursquare reintroduced “nearby friends.” After all, Foursquare would like to keep its users — and the data they contribute. And, of course, they don’t want check-ins to go away. So what was going on at Foursquare HQ? There were no answers to be found. A rep just parroted mindless nonsense about setting records “in nearly every engagement metric we measure internally” since relaunching the app.